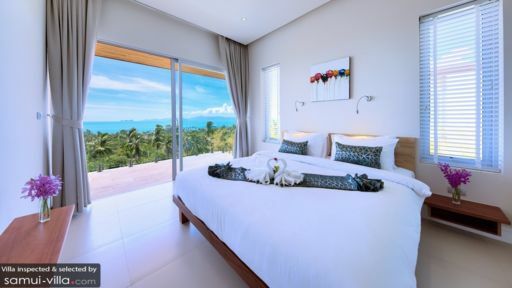 As part of a luxurious villa estate hosting six individual villas, Villa Daisy is a three-bedroom paradise located on the hillside of Samui’s Bang Por area overlooking the bay. Apart from spectacular views, you also have the advantage of being near the ocean so that you can head down from your location to the beach with much ease. Sprawling lush tropical flora encircles the villa marking its periphery thus, providing you with a wholesome and naturally abundant view all-around. The villa with its infinity swimming pool is definitely at a prime location and while you laze around without a worry in the world, you’ll learn to truly enjoy being amidst nature. 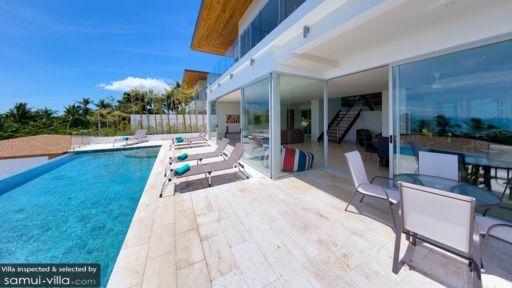 Villa Daisy hosts three bedrooms, each of these are located on the second floor to allow ocean views from each bedroom. There are king-sized beds for your utmost comfort as well as several other amenities. Since you have a private balcony from where you can take in the scenic beauty of the island, relish a cup of tea early in the morning to start your day off wonderfully. There are en-suite bathrooms with necessary amenities such as basins, showers, and/ or bathtubs! A 14-metre infinity swimming pool dominates the outdoor space of Villa Daisy allowing you to bask in the tropical sun endlessly. Lounge on the sun chairs found on the pool deck where you can either take a nap or read a book to pass time leisurely. The clear-blue skies form the perfect blanket to a perfect daytime siesta! An alfresco dining area on the deck is the ideal spot for your breakfast or evening meals as you can even relish the fresh ambiance while enjoying delicious food. Featuring simple and clean white interiors, the villa living room is furnished with an L-shaped sofa facing a 55” flat-screen TV with DVD player. The comfortable room allows guests to mingle with one another easily. There is minimal décor in the room and the air-conditioner allows you to enjoy the cool ambiance indoors if you wish to escape the afternoon heat. There are bean bags in the living room for additional seating and lounge space and placed beside the sliding glass doors, you can take in the ocean view at all times. There is a dining area towards the other side of the living area with seating for up to eight guests comfortably. A fully-equipped kitchen is found in the far corner of the living room just behind the dining table. There is a breakfast bar with bar stools for guests to grab some drinks while they’re enjoying themselves immensely. Excellent services ensure that your stay is smooth from the moment of your check-in to when you finally check-out. There is housekeeping, maintenance, and daily breakfast included as part of your stay and since you will be staying at a private estate you have access to various amenities including tennis courts, gym, and a children’s play area. A free shuttle takes you to the Bang Por area where you can shop and dine. 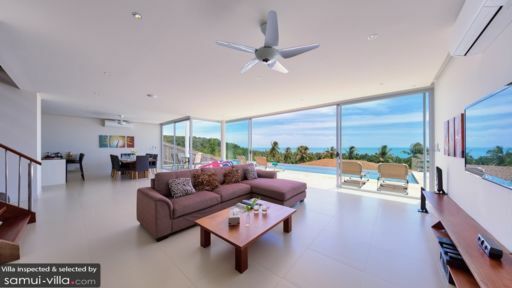 The villa is near Bang Por bay so you can head to the beach whenever you wish and rest on its sandy shores. There are several restaurants in the area that you can explore as they offer delicious local and wester fare.